Short story I made for the Danish comic anthology Fantasmagori 6. It’s very loosely based around an old Scandinavian fairytale about a human princess and a troll princess switched as infants. This first page especially draw inspiration from Scandinavian fairytale illustrations of dark trolls and almost glowingly blonde human children. In Scandinavian folklore trolls and other creatures from the underworld often acted almost the same as humans. They were often told about as evil (and especially non-christian which back then automatically made them *very* evil), but in other stories they were falling in love, trying to protect and/or help their children or simply trying to protect themselves. 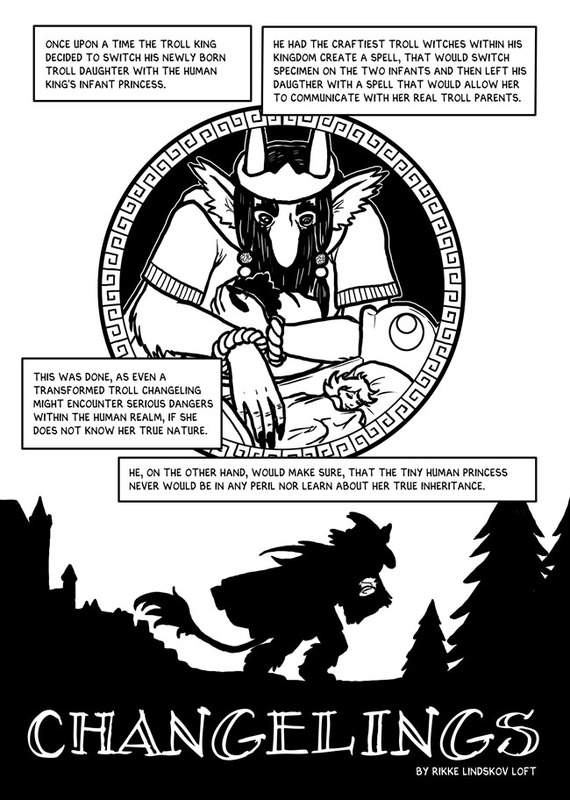 Changelings were a common concept, where a creature from the underworld would steal a human child, and leave one of their own children in the child’s place. One way to get your own child back, was to treat the changeling so poorly, that the troll mother would come running to save her own child, giving you back your own child in the process. Some people actually did this to mentally or physically handicapped children, hoping they could get their own perfect child back that way. Often this could lead to the death of the unfortunate “changeling”, while the desperate mother tried to retrieve her “real child”.